Japanese tattoo artists are arguably amongst the finest and most skillful in the world, and they certainly produce some of the most artistic, intricate, and amazing tattoo designs ever created. Their designs, sometimes covering the full body, attract people from all over the world to their shores. But getting a traditional tattoo done in Japan is always going to pose a bit of a problem for nonresidents. There are surprisingly few tattoo studios in Japan which mean that there are often long waiting lists. And, as demand often tends to outstrip supply, they can also be pretty costly. Also, if you are looking to have a substantial piece of artwork etched on your body, it is likely to take a fair amount of time, involving a number of sessions. This means that you will be stuck in Japan until the job is finished. But don’t despair; we have some great news for you as now you can get a Japanese traditional tattoo done at All Day Tattoo in Bangkok. To help you decide whether Japanese tattoos are for you, let’s take a brief look at precisely what Japanese tattoos are all about. Some people maintain that the art of tattooing actually originated in Japan. Whether or not this is the case, there is no doubt that Japan has an incredibly proud history of tattooing which may date as far back as 10,000 B.C. Historians believe that women of an ancient Ainu tribe used to have their lips tattooed – possibly a precursor to lipstick but a mite more permanent – and other historians maintain that the cord-marked patterns that can be seen on the faces and bodies of people who lived thousands of years ago are in fact tattoos. What is certain is that Chinese observers of the 600-year period from 300 B.C. to 300A.D. report that tattoos became very popular, and they were highly sought after status symbols, as well as having spiritual significance. But then the heyday of Japanese tattooing, or Irezumi , as it is known, (meaning ‘insert ink’), started to take on a distinctly disreputable image. At around 300 A.D., the marking of criminals with tattoos – known as bokkei – came into vogue. The practice of bokkei continued for the next 500 years, right up to 1868 when it was finally abandoned. However, during the latter 200 years of its existence, criminals who were ashamed of their markings had them covered up with more creative designs. This led to an ‘underground’ tattoo movement. Many ordinary Japanese citizens started to have works of art tattooed on their bodies, such as dragons, mythical beasts, and flowers. Some historians maintain that it was the working classes who liked to display their tattoos, while others say that it was the wealthy merchants, who by law had to appear humble and the expensive irezumis were hidden under their clothes. Probably both versions have some truth, and tattoo historians agree that it was during this 200-year period that the grand and distinctive tattoo designs started to develop. Some of the revered artists of the time, whose artistic talents had been handed down by their forefathers, adapted their skills to imprint their magical designs onto human flesh. They even used the self-same tools that they had previously employed to create their woodblocks for printing. Can you imagine your tattooist using a chisel or a gouge to produce your tattoo? It was also during this period that the unique Japanese Nara ink, originally used in woodblock art, (‘moku-hanga’), came into use. When the practice of Bokkei was abandoned, the authorities decided to ban tattooing completely. So during the period 1868 –1912, (the Meiji period), the Japanese tattooing industry was driven underground where it continued to flourish, especially for foreigners. For the indigenous population, tattoos became ever more associated with criminals and criminality –especially the Yazuka (Japanese Mafia) who had their own special tattoos. Then ‘Uncle Sam’, as leader of the occupying forces at the end of WW2, once more legalized tattooing in 1948. Over the decades since, tattoos have become quite popular amongst the post-war Japanese and especially for foreigners who have flocked to Japan for this express purpose. But even to this day, much of the Japanese establishment still regard tattoos as belonging to the yazuka criminal classes, and in some public places, such as gyms and golf courses, people with tattoos are actually refused admission. This partly explains why there are still relatively few tattoo studios in Japan. Many traditional Japanese tattoos are big in concept and cover quite large surface areas of the skin. These traditional designs have been handed down through the generations and the artists doing them have amazing skills. Each tattoo contains images and symbols that have specific meanings; so if you are thinking of getting a traditional Japanese tattoo, it may be advisable to understand the ‘motifs’ – design elements – that you will have imprinted on your body for the rest of your life. Japanese designs are always elegant and will fit the body perfectly. Some styles, including one known as a body suit, will cover your whole body. Dragon (Ryu) – In Japanese culture, the dragon is a benign creature and relates to water and the rain. It stands for wisdom, strength, and generosity. Dragons are one of the most popular design elements used by tattooists. Koi (Carp) – Koi has the ability to swim against the current and if it reaches the ‘dragon gate’ it will be transformed into a dragon, so it represents determination, courage and a desire for success. Tiger (Tora) – Tigers are important in Japanese art as they represent strength, courage, and good fortune. Lion/Guardian dogs (Shishi/Komainu) – Like tigers, lions are regarded as bold strong, courageous and heroic and are the guardians of shrines. Skull (Zugaikotsu) – in Japan, the skull represents the cycle of life and death, but in a much more positive light than it does in the west. Phoenix (Fushicho) – As in the west, the Japanese phoenix disintegrates into to ashes and then revives itself, representing revival and ultimate victory. Snake (Hebi) – A snake can be many things – it protects against disasters and misfortunes; it has the wisdom to moderate your decisions; and by shedding its skin, it can cure and revive. It also symbolizes the power of men and the sanctity of women. Ogre/demon (Oni) – Ogres are very fearsome, and are generally regarded as the symbol of evil. The Queen of hell uses ogres to punish people for their evil doings. There are also Good ogres that are a symbol of protection. Flowers (Hana) – there are many different flowers in traditional Japanese art that represent a range of meanings. Peony (Boton) means elegance and wealth; Japanese Maple Leaf (Momiji) is a symbol of the passing of time; Chrysanthemum (Kiku) is a symbol of perfection; Cherry Blossom (Sakura) represents the fragility of human existence – of life itself; Lotus (Hasu) is a symbol for enlightenment – an awakening to the meaning of life; Rose (Bara) is eternal love or new start; Orchid (Ran) means courage, power, and strength. If you are a fan of Japanese traditional styles but would like them to see them ‘turned on their head’: made brighter, more startling and ultimately unique, then new school Japanese tattoos may be what you are looking for. Japanese New school is the art of combining modern designs with Japanese traditional motifs. The designs take on more exaggerated forms and the colors are much brighter than the old-school traditional colors. The lines are often calligraphic and the designs can contain all manner of modern unique patterns, graffiti style jagged edges, bubble lettering, and so on. They are often more cartoony, and some have highly stylized fantasy themes. In essence, new-school artists don’t stick religiously to traditional designs, and the results can be startling and idiosyncratic. Japanese tattoos at All Day Tattoo in Bangkok. 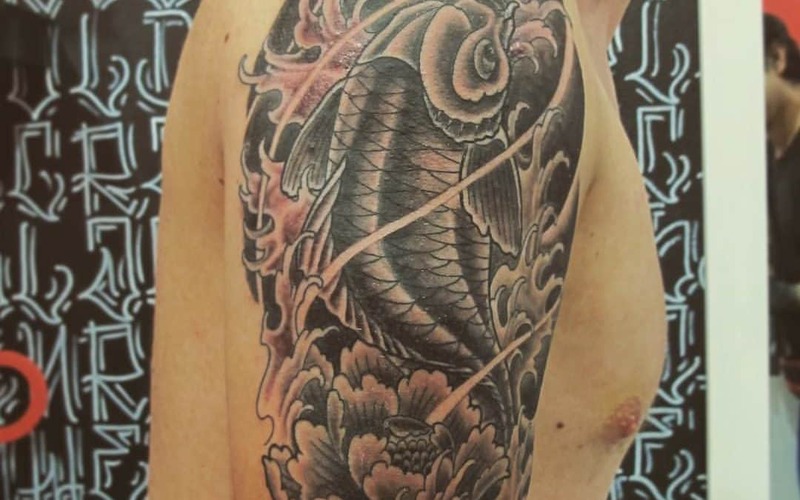 There is no need to fly to Japan to get your Japanese tattoo, as one of the top resident artists at All Day Tattoo is a highly acclaimed expert in both old and new school Japanese tattoo designs. ‘Eight’ has traveled extensively throughout South East Asia to study and refine his skills. Over a period of 15 years, he has taken up studio residencies in both Japan and Korea, where he perfected his craft. Come and meet our team and discuss your ‘dream’ Japanese tattoos with us. You will find us patient, friendly and helpful. Why not click on the button below to book a free, no-obligation consultation. We’d love to see you.